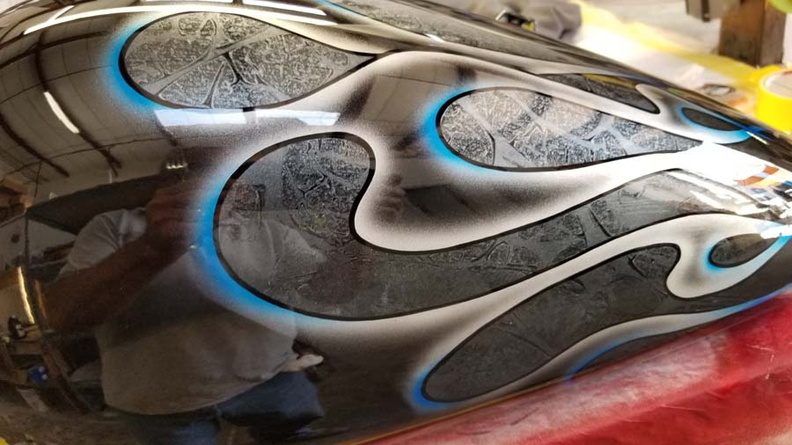 We are proud to say that we’ve entered our 17th year (2002-2019) of car, truck and motorcycle painting! If you’re looking for a reliable, experienced paint shop that does top quality work and backs it up, ACP is the right choice for you. Although we primarily paint motorcycle tins, we will paint just about anything. We’ve painted cars (overalls & spot jobs), guitars, bicycles, rc boat and even a kitchen mixer! We are proud of our work and we offer affordable prices that work with your budget. Our website is updated frequently with new information and new paint jobs. You’ll find thousands of photos of work we’ve done for our customers – you’ll see our customers’ names and locations on most of the jobs – our customers love it because it’s like their own webpage of their new paint job! You can even see photos of some of our customer’s bikes after they installed their newly painted tins. When viewing our photos, you’ll notice that all of the photos are taken either outside (most of them) or in our office, so you can see what the paint job REALLY looks like, not in enhanced lighting conditions, or photoshopped to really make the paint ‘pop’ even more. We also post close up shots so you can see how flat the surface of the paint job is just from looking at the reflections. We’re not shy about showcasing the work we do – check it out for yourself! If you need more reasons to choose us to do your paint job, check out our Testimonial section and read feedback from our customers. Need more reasons to choose Attitude Custom Painting, click here! It’s free to view our Gallery! Next story How about a trip down memory lane?